To kick off this post, I have to apologise to the band "The Killers", whose song title made a perfect title for this photo and its resulting blog post. As you may know, we recently returned from an amazing family safari-camping-roadtrip through some of the most iconic places in Namibia. One of the destinations was the famous Etosha National Park. Though it was not my first visit to Etosha, this was definitely my longest to date. We stayed a total of 12 days in the park, to ensure we made the most of each of the main camps and its surrounding regions. 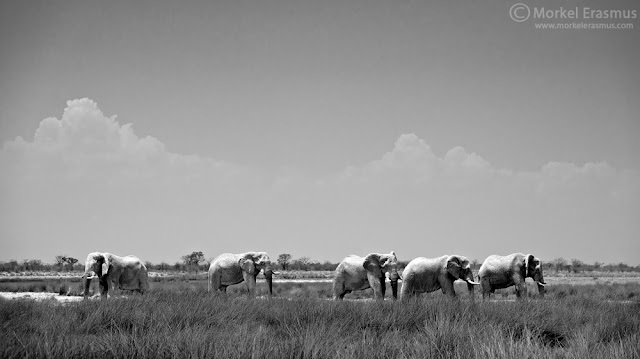 We first saw these elephant bulls when we transferred from Namutoni camp to Halali camp. They were moving across the pan towards the mudholes at the Springbokfontein waterhole. Because we were busy moving camp and had our big trailers hitched, we could not maximise the sighting for us photographically. It was also in the heat of midday, which meant the heat haze affected the quality of our photos. During our stay at Halali, I was tempted to see if these bulls perhaps frequent this particular waterhole. 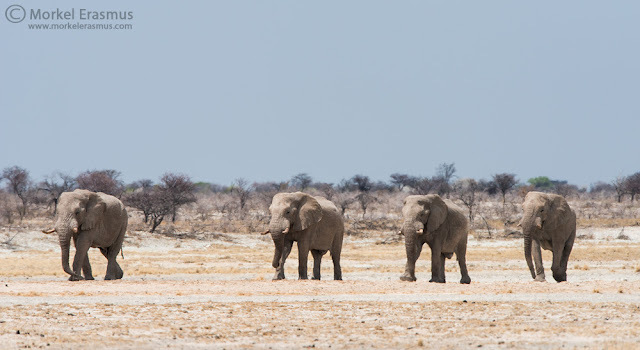 I made a late morning run to this waterhole (a 32km trip one way) - and lo and behold, they were there, albeit further from the road than what is ideal. I knew now that these boys were the locals, this was their pub, and they would probably be found here most days until the rains come. We decided to return in that direction the next morning - and although they weren't there when we first arrived, they had made their way to the same spot far from the road by the time we got back from our brunch stop (we made delicious jaffels on the edge of the Etosha Pan, yum)...this time there were a total of 9 elephant bulls in the immediate area! The 4 we'd seen previously, and another 5. Photos were, again, hampered by the heart haze (it was upwards of 45 degrees Celcius by this time). That hatched a plan for me. 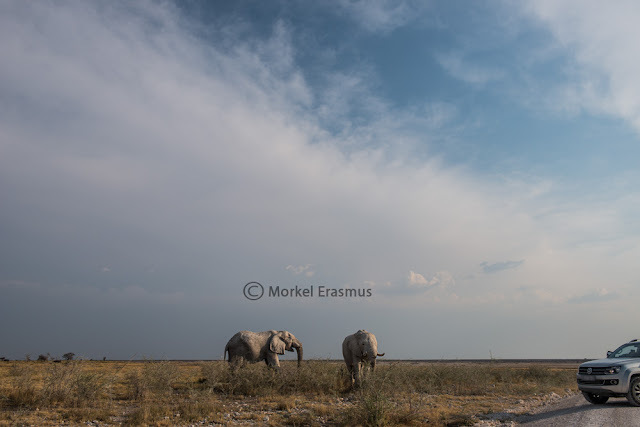 The next day we would be moving from Halali to Okaukuejo, and although the potential is there for the "white ghosts of Etosha" to be photographed around that area as well, I really wanted another crack at getting bankable photos of these boys. 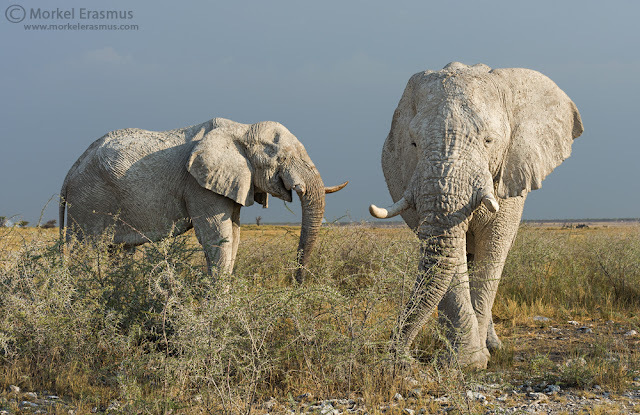 So we decided to scoot out to Springbokfontein one last time that afternoon, in hope that they would still be around the waterhole and possibly even close enough for decent photos. Man, were we right!! Some of them had moved off way into the bush, but 2 of the bulls were feeding right next to the road, and they were super relaxed...meaning we could work some really nice closeups and even wide angle shots of them. The golden afternoon light and some puffy clouds made for a very enjoyable afternoon of photography. Are these photos unique - will they win me awards? Did my friend and I enjoy the culmination of my quest to photograph these white boys? Go out there, and enjoy your photography!